There’s nothing pee-shy about Kevin Bellie’s fresh and infectiously giddy approach to Mark Hollmann and Greg Kotis’s tongue-in-cheek musical. In 2006, members of the creative team behind the Broadway production of Greg Kotis and Mark Hollmann’s hilarious pay-toilet musical got litigious with the creators of a production at Chicago’s Mercury Theater. The Broadway folks felt the Mercury staging too closely resembled theirs in arguably uncopyrightable areas such as direction and design (the matter was later settled out of court). Don’t expect Circle Theatre to face similar hassles for this fresh and appealing take on the tale of a city whose crippling drought forces the powers-that-be to turn peeing into a privilege, until downtrodden citizens finally rise up in revolt. In place of the original’s 1930s-style social realist look, director Kevin Bellie adopts a fanciful and fruitful steampunk aesthetic, with Jesus Perez’s costumes incorporating Victorian fashions and mechanical accessories. The mood, meanwhile, is infectiously giddy. Much of the credit goes to Bellie’s deliriously goofy choreography, which follows a more-is-more approach, encompassing everything from the Charleston to Soulja Boy. 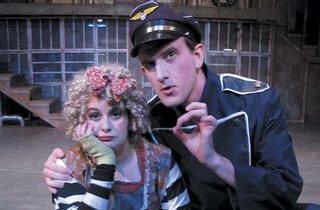 The torrent of allusions complements Kotis’s self-aware book, which wittily spoofs other shows by having narrator Officer Lockstock (Clay Sanderson) and Greek chorus Little Sally (the scene-stealing Brooke Sherrod Jaeky) regularly comment on the ways their show violates theatrical conventions. Though his voice is a bit thin, Creg Sclavi brings the right open-faced guilelessness to Bobby Strong, the leader of the rebellion. He’s backed by an ensemble whose work gets too loose and undisciplined at times, but what the performers lack in polish they make up in sheer exuberance.